← #Interview & #Giveaway: Tracy Krimmer, author of several romance novels! I recently read/reviewed Tracy Krimmer’s novel, “Caching In”. So, I was very excited to be able to move on quickly to the next story in her “Pastime Pursuits” Series. I am sure you will feel the same way. In “Caching In”, we are introduced to Chelsea Wyatt. She is not the most likable character, as she was dating a man in another relationship…and, she was the other woman. But, I LOVED HER! She was very real. In “Caching In”, we find out that Chelsea is pregnant. 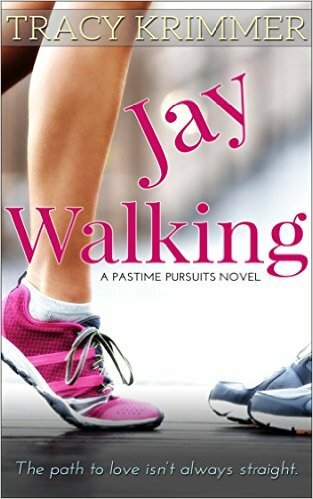 Although, “Jay Walking” could definitely be a standalone novel. This story is all about Chelsea. She is raising her son James on her own. When the story begins, Chelsea decides that she is not happy with her body, and she is going to walk off the pounds. Jay is a doctor and has a ton of awesome qualities, so it was hard for Chelsea not to fall for him. But, is there even the possibility of a relationship there? Tracy Krimmer can certainly deliver great chick lit stories. I highly recommend her books. Great review! Both of the books sound interesting. I will have to check into them! I’m so glad you enjoyed it! Watch for Kate Hayes’ story (Seth’s sister in Caching In) next year!